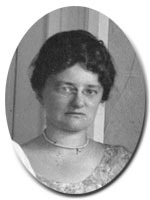 Frances Remington Kelley (1886 - 1955) came to Cornell in 1917 as an instructor in food and household management. She was born in Northfield, Minnesota and received her B.A. from the University of Minneapolis in 1909. From 1916 to 1917 she taught science at East High School in Minneapolis. Although she was at Cornell for only three years, Kelley taught a diverse curriculum within home economics, including "Foods and Nutrition," "Elementary Sewing," "Handicraft & Cookery," "Household Management Practice," and "Household Management & the Apartment Problem." She took a leave of absence from Cornell in the spring of 1920 to complete her M.S. at Teachers College, Columbia University, and then returned to her home in Minnesota to become an assistant professor of household management at a Minneapolis public school. Kelley went on to become the director of lunch rooms and home economics supervisor for Minneapolis public schools. In addition to her work in Minneapolis public schools, she was a member of the Sigma Tau sorority, president of the Minnesota Home Economics Association, and a president of the Minneapolis Women's Rotary Club.